The focus of the Vincentian Netball Association is the trophy of the 17th Eastern Caribbean Central Bank (ECCB), Organisation of Eastern Caribbean States (OECS) Under 23 Netball competition in Antigua next year. The victory was an amazing turnabout. The Vincentians came from as many as six goals behind to nip the St Lucians in the final burst. The quarter time scores read 11:9, 20:18, and 31:27 in favour of St Lucia. One or two diehard St Lucian fans were already dancing on the side of the court, confident that the match was already sealed but the Vincentians had other thoughts. Urged by a frenzied home crowd, vibrant in support of their team, the table rapidly turned as the Vincentians equalised at 40. The battle intensified as the final seconds ticked and from 41 all, the home team clipped the decisive goal with the timer moving towards the umpire. The final whistle created an eruption of jubilation in the arena which was staging such a tournament for the first time. Leeanna Lewis, the nation’s goal attack was named player of the tournament. Her court mobility, maneuvering in the attacking third and converting with accuracy when it mattered, also gave her the country’s MVP. 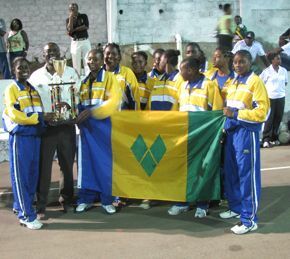 Vincentian Saskia Diamond was the Best Centre Court Player. St Lucians Dedra Mathurin with an average of 85.07 copped the Most accurate shooter award, and her colleague Safiya Paul was Best Defender. Individual awards went to Antigua and Barbuda’s goal attack Amy Lake, Dominica’s goal shoot Stacy Fontane, Kittitian Centre Kitzier Gumbs, and St Lucia’s Roxanne Synder.